Patti Mollica will be teaching a workshop called “Bending Reality – Color Theory Schemes and Strategies” at the Rowayton Arts Center (RAC) the weekend of February 9 and 10, from 10 am to 4 pm each day. In this workshop, learn how “less is more” in your palette for good color harmony, and learn to work with the colors of your choice. Many painters feel bound by the colors they see, which can lead to predictable paintings that lack drama, no matter how well they are painted. It’s important to learn how to harness the power of color and use it to communicate your artistic vision. Patti, author of Color Theory, an Essential Guide to Color will be teaching the strategy behind working with color schemes and pushing color choices to the next level. 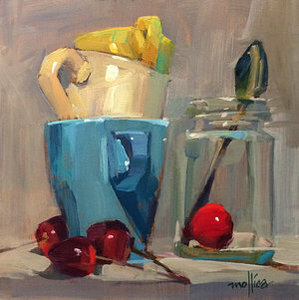 If you are ready to embark upon new level of color exploration, don’t miss this workshop! Suitable for all levels and media – acrylic, oils, pastel, watercolor, etc. Patti lives and works with her fellow artist and jazz musician husband in New York City and Nyack, New York. For more information visit pattimollica.com. The fee for the two-day workshop is $315. To register , please visit rowaytonarts.org/registration or call 203-866-2744 (x 2). The RAC Gallery and Art School overlooks the scenic Five Mile River in Rowayton, CT at 145 Rowayton Avenue.